Numerous studies over the past decade have touted the popular phrase “Good Design is Good Business”. But with such an intangible product, how can you know that good design will be “good” for your business? With all the great things we know design can do for your business (such as increase productivity, reduce turnover, increase sales, reduce building maintenance costs and many more) it can be difficult for designers and firms to understand the reluctance to invest in design. Perhaps you never knew what design can do? Ask Apple. They will tell you. While the most notable studies on the topic have come out of the U.K, there is increasing recognition throughout the Globe about the connection between design and business success. With all the information available online, finding the answers you need can be daunting, but here’s a bit of an overview. A 2005 report by the UK Design Council pointed out the main flaw to most reports relating design and business. It states: “All worthwhile plans and projects need to be based on sound evidence.” Most people in considering their business plan fail to account for how good design can benefit them, based on a lack of evidence connecting the two concepts. In 2007 the same council published the Value of Design – Factfinder Report, summarizing the results of two pieces of research, clearly demonstrating the value of design for businesses. The report can be found online at http://www.designfactfinder.co.uk/. – businesses that add value through design see a greater impact on business than the rest. There are real life examples of good design resulting in good business in top earning global giants such as Apple, RIM and even Target. Think about the digital media market- Apple continues to dominate despite slightly higher prices for one main reason- quality design that keeps consumers coming back. Think about the role design played in creating the ‘environments’ in some of the top money earning companies such as Lululemon Athletica, Starbucks, and BMW. All use design to portray their image, and reinforce their corporate brand, all which increases profits = $$$. Design can help your business convey an image, create an atmosphere and make your company unique in a world of increasing competition. Design is proven to significantly improve sales, profits, and deliver a competitive edge to your business. – save you money over the life of the building. Rather than just creating appealing and original spaces, a well-designed building/space can result in cost savings for any business. Decreasing absenteeism, operational costs, and boosting moral, architecture is proving itself in the post recession world. Creating targeted approaches to the largest costs associated with operating a business such as heating and cooling, design can lower energy consumption and reduce costs. A recently completed project by the Region of Niagara at its Recycling Centre applied these design based cost savings measures, creating an environmental showcase for the Region and providing a real life example of the benefits of good design. As an innovative solution to both the environmental and economic costs of regulating temperature within the plant, the design team installed solar chimneys, taking advantage of the suns energy to draw and exhaust hot summer air out of the plant, using natural ventilation principals to regulate temperatures and encourage airflow. Focused on efficiency and reducing operational costs, the re-design of the plant featured efficient lighting, and the installation of skylights resulting in a cost savings of over $12,000 annually. By installing geothermal, the design reduced the requirements for gas fired heaters in the plant by 75% achieving their goal of environmental sustainability, toward a vision for the facility in line with the basic principals of the recycling program which it houses. A major success, the Green Retrofit at the Niagara Recycling Centre acts as an example of innovation, and stands to support the phrase that good design is good business. Although rarely associated in the minds of most people, architects can provide the design services to help you succeed. Drawing on extensive experience architects offer services that can maximize the value of your resources to achieve your goals for the present and the future. Offering free sessions to discuss your project, and review a custom design through our ON Target TM packages are available to suit any needs- with no obligations. The only question to consider in reviewing the literature and resources available is- Do you want to improve your bottom line? At our office, whenever we want to be reminded of the power of good design for our clients, we call up our contacts at the Independent Living Centre of Waterloo Region, and ask to speak to a new employee. After he’s finished gushing about how wonderful the ILC loft renovation is as a working environment, we can return refreshed to what we do best, helping clients achieve their goals through design! This entry was posted in Architecture, Design, Urbanism and tagged consultant value, design, quality on 2011/05/24 by adminjma. Now that we have come out of our winter hibernation we are reminded what great benefits we can gain from the sun. The sun has a path that it travels each day throughout the season. The path has two angles that affect how a space can be daylit. There is an angle relative to the building usually indicated by North, South, East, and West. Then there is the angle above the earth. Each direction that the light comes through has a different characteristic. North light is consistent. The sun never gets close to north in this region, so the light entering a north window is never direct rays but incident light reflected off of other surfaces. North light is good for studios, office spaces because of the consistent light. South light is direct and powerful. In the summer the angle is very high above the earth and in the winter the angle above the earth is very low. We can use this characteristic to our advantage. In the summer we can reduce the heat that enters the building by using horizontal overhangs. In the winter the angle is low and the space can take advantage of the heat gain to warm the space. This is address more in our post about passive heating. South light is good for living rooms, kitchens, and spaces you spend lots of time in. East light is glaring. The morning east light enters windows at a low level and is difficult to control when entering a space. East light can be very intrusive and irritating. An egg crate shader on the window helps control the direct rays, while still allowing reflected light to enter. East light is good for bedrooms, as long as you don’t want to sleep in! West light is the more powerful of the two. It contains the heat and power of a day of shining. Similar to east light it enters the window at a low angle, but unlike east light it is much hotter and can warm a space to an uncomfortable level. The egg crate shader is again a useful tool to control this light. Vertical louver shaders can also be used. West light is good for green houses as well as porches and gardens for you to enjoy the sun in the evening. We think about daylighting a building immediately when we orient the building on the site. The ideal lighting orientation of the building is to maximize the south light, as it is most easily controlled. A long skinny building that has a long side facing south and north is a good example of using daylighting in the design of your space. This orientation will ensure that all spaces have access to sunlight and views and can reduce the heat gain from the summer sun. Daylighting must be done carefully as there can be harsh results to daylighting including unwanted heat gain and glare. When thinking about lighting make sure that shading from the sun is done outside of the building. Once the light has entered the window the heat has as well. Shading done on the inside of a building does not reduce the heat gain nor the air conditioning bill. Glare and contrast can also be a problem when you arrange a room with tv, computers, and other electronics as the sun can ruin a good movie! This entry was posted in Uncategorized on 2011/05/13 by adminjma. Weekend Walk a Huge Success! JMA’s second Jane’s Walk, held Sunday in conjunction with the Pedestrian Charter Steering Committee, was a tremendous success. 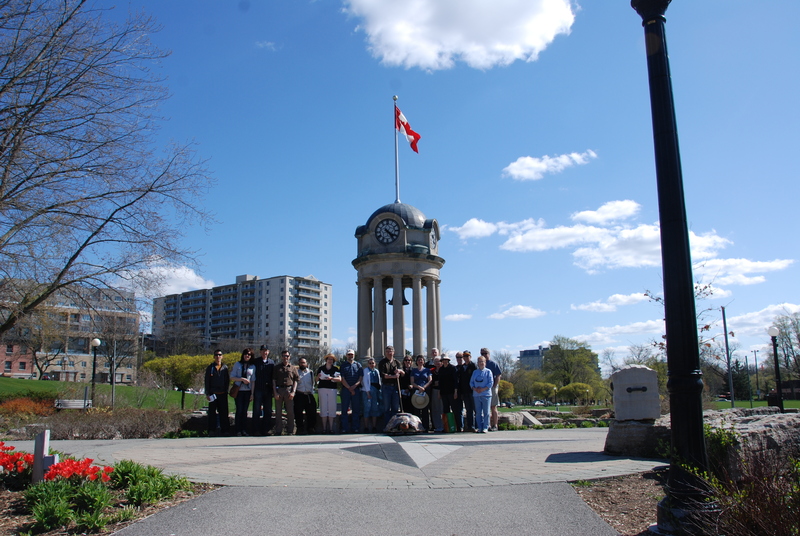 Close to 30 participants young and old enjoyed the sunshine and warm temperatures, and a lively discussion of what makes for great walks. For Jane Jacobs it’s about a layering of uses and activities, short blocks and many intersections, and lively offerings from businesses and users alike. As William Whyte discovered in his ground-breaking research on successful public places, what attracts people most are other people (and the occasional turtle!). The route included a trip through Kitchener City Hall itself, a marvelously open and useable building designed by Toronto architects Kuwabara Payne McKenna Blumberg in the early 1990’s . We exchanged stories about the places and streets we visited along the way, and catalogued ideas for improvements. One of the principles of great spaces is that there are at least 10 reasons for being there, and although Hibner Park, City Hall and its Civic Square, and several other spots along the way clearly met this criterion, there is no doubt room for improvement in many of our streets and spaces. At the end of the walk, leaders John MacDonald and Margaret Santos were asked what keys to success we would recommend to improve our pedestrian realm, our city, and our transit system. We summed it up in two words: quality, and convenience. Make the pedestrian experience, including public transit and cycling, the most convenient option, and it will flourish. Commit to quality in the elements of that public environment by providing layers of great experience, and people will want to be there. And where there are people, there is success. Leading Sunday’s Jane’s Walk was the newly named Pedestrian Charter Steering Committee mascot- “Martha.” Congratulations goes out to Joel Watamaniuk for entering the winning name. We hope you enjoy walking around the community in your new Converse shoes provided by Nigel’s Athletic Direct located in Market Square, Kitchener. The Pedestrian Charter wishes to thank everyone for participating and encourages everyone to walk as a way of getting around. Hope to see everyone again at next years walk! This entry was posted in Community, Urbanism on 2011/05/09 by adminjma.